USS Liberty survivors Phillip Tourney, Ron Kukal and Larry Thorn lead a brief ceremony, including a reading of the names of those who died. Frustrated and angry about being relegated to a footnote in the middle of one of the most tense military times in world history, survivors of the technical research ship USS Liberty continue to make a stand to be heard. And they are doing so in Maricopa. A deadly attack on the U.S. naval vessel in international waters by Israel Defense Forces on June 8, 1967, has continued to be a hot-button issue for those involved. Some survivors of the USS Liberty have made Maricopa their home, as have those who served on aircraft carriers involved in the incident. Former crewmembers of the Liberty and the carriers gathered at Raceway Bar & Grill on Memorial Day weekend to pay tribute to the 34 men who were killed and the 172 injured. George Sokol, who was aboard the aircraft carrier USS America, has played a key role in getting local notice for the survivors and reuniting them. That includes getting a proclamation from the Maricopa City Council. Liberty survivors Phillip Tourney, Ron Kukal and Larry Thorn led a brief ceremony, including a reading of the names of those who died. “We want to tell the truth and honor our shipmates,” Tourney said. Taking place as it did amid the Six-Day War between Israel and Arab nations and the Cold War friction between the United States and the Soviet Union in the Vietnam era, the impact of the incident was quickly minimized at the time. Official reports, eye-witness accounts and the subsequent release of more records over the years have kept the attack a he-said-she-said affair even half a century later. The ship was torpedoed, hit with napalm and strafed by the Israelis, but did not sink. Aircraft carriers USS Saratoga and USS America picked up survivors and dead. Ties among the veterans of the three vessels and others that came in support have remained strong over the years with the shared memory of that ugly day. 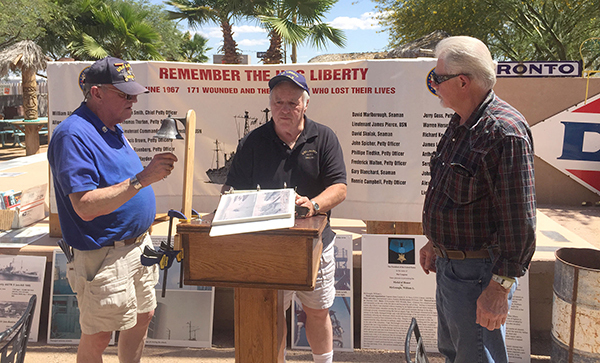 It is why long-time Maricopa resident John Nuss, who was aboard the Saratoga, has been involved with the Liberty commemoration. Kukal, who came down from Wyoming for the event, said it was only by the grace of God he survived the attack in the eastern Mediterranean Sea. “The heroism by so many crewmembers saved that ship,” said Tourney, former president of the USS Liberty Veterans Association. During the attack, aircraft from the America were sent in twice but recalled both times. Because the aircraft carried nuclear weapons, Tourney said “the Cuban Missile Crisis was a square dance” in comparison. Those at the Memorial Day commemoration expressed bitterness toward Israel and, even more so, the Lyndon Johnson administration. Sokol said Johnson willfully left the Liberty crewmen out there to die to keep from embarrassing Israel. “Anytime you criticize Israel, you get called anti-Semitic,” Sokol said. Israel’s official stance has always been that it was a case of mistaken identity, and its tired military personnel first thought the technical research ship was an Egyptian destroyer. Tourney is among the survivors who call that nonsense and claim the attack was deliberate to prevent the Liberty from reporting Israel’s maneuvers in the Golan Heights. He dismisses Israel’s claim that pilots never saw the American flag on the Liberty even when the ensign that was shot down was replaced with a larger flag. Many early military reports on the attack accused the Israel military of “gross negligence.” Though Israel has paid out more than $12 million in compensation to the United States over time, the veterans are not satisfied the nation has ever given a factual account of what happened and why. The efforts in Maricopa, Sokol said, are small inroads toward gaining recognition for their experience.